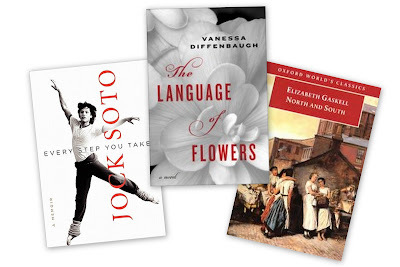 The Sunday Salon [10.9.11] – my books. my life. Good morning on this dreary Sunday. We don’t often get real rainy days in Florida but today is looking like one anyway. I suppose it is time for me to snuggle up with a book all day and try to finally get over this cold that’s been lingering. This week I finished three books. I finally, after months and months and months, finished North and South (and now I am watching the BBC adaptation). I also finished Every Step You Take and my audiobook, The Language of Flowers. 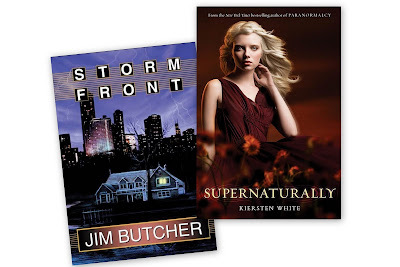 I started Storm Front, the first in the Dresden Files series, on audio solely because of James Marsters. And in print, I am finally reading Supernaturally, the sequel to Paranormalcy. Quick complaint: I have the hardest time remembering the events of earlier books in series. I mentioned this in my review of Demonglass this week, and now I am having the same problem with Supernaturally. No matter how much I love book, I just can’t make the facts stick long enough to get to the next one. I might have to start waiting for entire series to be published before I read them. Does anyone else experience this problem? What do you do to refresh your memory? How did you like North and South? I have always wanted to read it. I have the same problem. Even with series like Harry Potter (which I love) I fail to remember even the important things. If possible, I try to see the film version of the first book(s) before starting the new one. I have the same issue, although once I get reading I start to recall things. I wish I had time to go back and re-read but I don’t. I can’t believe this rain. I don’t remember the last time we have gotten so much, with the exception of the hurricanes. I’m tending now to do the whole wait for the series to be released thing, because it is so easy to forget and it means you can’t enjoy the book as much as you might have. I am going to look into Every Step You Take, did you like it? I like it when an author recaps the events of the last book at the beginning of the next book. If they don’t I’ll check Wikipedia for a summary. Hmmm, I’ve been known to skim previous books in a series if I still have a copy. Otherwise, I’ll read people’s reviews and/or plot summaries. I will also look at my old notes. If I have time, I will reread previous books. It is a great refresher and gets you excited for the next book even more than you were. I am hoping to get started with The Language of Flowers soon so I can pass it on to Sandy. Everyone seems to just love that book, so I am looking forward to hearing what you have to say about it. The movie version of North & South is one of my favorites. Richard Armitage spends the whole movie smoldering. The book was good, too, but I recall it being filled with a lot of social commentary that got old after a while.